Timothy Cornwell of Arts Press visited the exhibition and wrote a great piece about the show. Here is a small except – click here for the full article. The British-born Masson has since moved back to the UK, broadening her work from photography to research, taking a master’s degree in photographic history from the University of St Andrews. 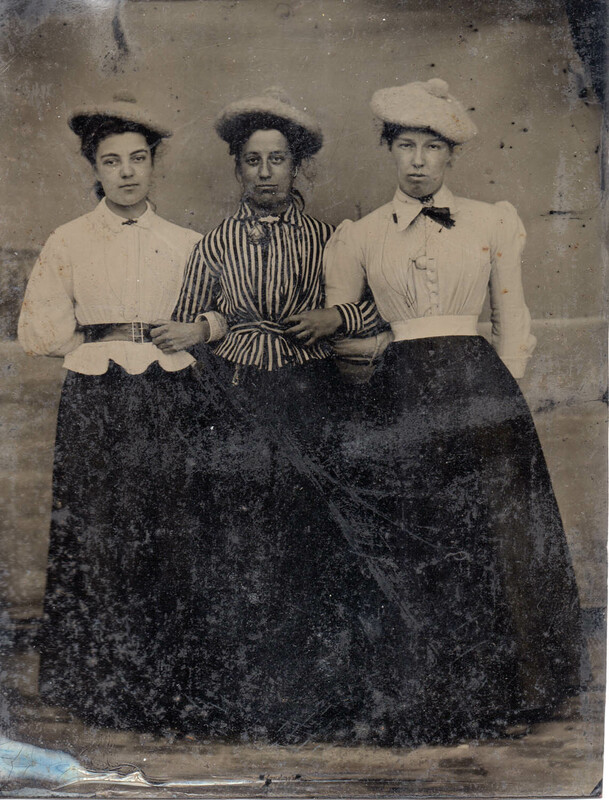 She has also built up a collection of about 300 tintype photographs, mainly bought in Britain. Tintypes emerged in the late 1850s as a cheaper and quicker successor to the daguerrotype. Also known as ferrotypes, they are single prints on a thin varnished iron plate covered with liquid collodion. They could be quickly exposed, developed, and fixed with a large plate camera and a mobile studio. Hardy and inexpensive, tintypes were hugely popular in the US, carried by soldiers in the Civil War. Typically, in Victorian Britain, itinerant tintype photographers went town to town, particularly to beach resorts, wheeling a trolley which could carry a light-safe tent. But in a period rife with social prejudice, they were long disregarded; both photographers, and their subjects, were overwhelmingly of working class. That is still reflected today. While both the Museum of Modern Art and the International Centre of Photography in New York have hosted major tintype exhibitions, Masson’s recent showing of her collection in Edinburgh was billed as the first of its kind in the UK. In an international market where vintage photographs are swapped around in internet auctions, shots of families and children in Sunday best for a beach outing, pictured with buckets and spades or on a donkey ride, are the trade marks of a particularly British tintype. These early snapshots have an inimitable charm. She hopes to change that. Her Edinburgh show, Victorian Britain and the Tintype Photograph, now closed, but part of the Actinic festival, will with luck travel on to very appropriate setting of the seaside resort of Scarborough. Next year she plans to take a show to London, when her book, the first history of British tintypes, is due to come out. This entry was posted in Exhibition, History, Photography, Tintypes, Victorian and tagged exhibitions, history, photo history, photographs, photography, tintypes, Victorian, wet collodion. Bookmark the permalink.